Not many people know this about me but I am a bit of a thrifty shopper. I love to go to stores and find the best bargains – no matter if it’s clothing, housewares, or grocery items. I love the utterly satisfying feeling of getting something I want or need at an unbelievable price (maybe you’ve had this same feeling before as well). So whenever I stumble upon a great deal at the grocery store, I just HAVE to get in on it. Of course, that means that I have to also find a way to use the item I’ve purchased…but that’s the real fun of it all, isn’t it? On a recent shopping trip, I found an amazing deal on heads of cabbage. Taking a recipe I found from an old cookbook, I put my own twist on it to create the following Stuffed Cabbage Recipe below. It was a BIG hit with the family – even the picky eaters like my companion, Steve. Cut chicken breast into small, 1/2″ cubes. Saute chicken breast together with celery, onions, and mushrooms and season mixture with garlic powder, sage, dried onions, Italian seasoning, salt and pepper. Saute together until celery is tender and onions are translucent. Meanwhile, core the cabbage, making sure to keep the leaves in tact. Steam cabbage whole for 1/2 hour or until tender. Once chicken is cooked through and celery and onions are at the right consistency, add breadcrumbs to the mix. Slowly pour in just enough chicken broth to hold the stuffing together until you are able to mold it into a ball (not too soggy or too dry). Take 3/4 cup and press into an oval . Then wrap 2-3 leaves around the stuffing ball until completely covered. Place cabbage ball in 9″ x 12″ baking pan. Repeat process until you have 8 stuffed cabbage balls in pan. Cover pan with foil and bake in preheated oven at 375 for 1/2 hour. Remove from oven and serve. *For a fancy twist, you can add chopped nuts (pecans or walnuts are great) to the stuffing mix. 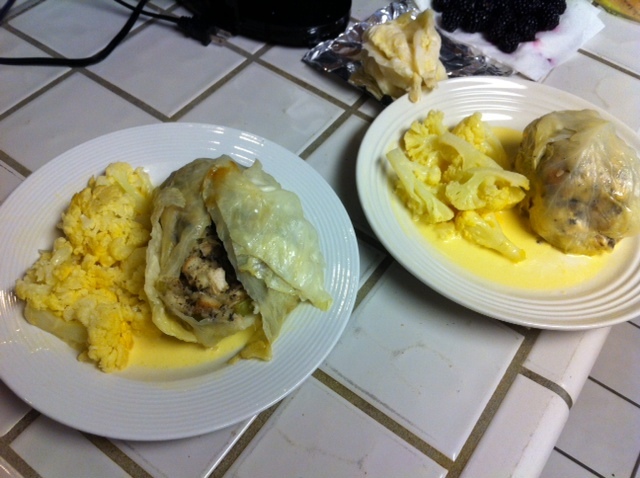 Hope you like this rendition of stuffed cabbage. Try it out and post your feedback in the “Comments” section below.